Magpie Quilts: Dresden Star Sunflower finished! I finished my sunflower! And I didn't go to the fabric store, but used the piece of brown I had in my fabric stash! 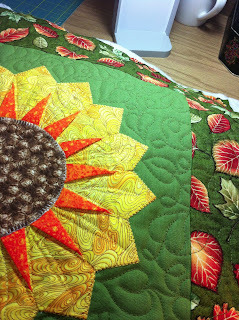 I quilted the brown centre with a pebble pattern in brown thread to resemble the seeds in the sunflower head. Then I changed to a yellow variegated thread and quilted the yellow petals, leaving the orange pieces to pop up off the quilted surface. Swirling leaves in green thread finish the piece off and I quilted it more densely than I usually quilt, just to keep the amount of quilting fairly uniform throughout! This was a fun little project to make - I will likely make it in a few more colorways in the future! What colors do you think I should try? That totally says summer to me. Love it!